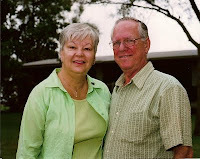 Today's guest blogger is another special person in my life - my mother-in-law, Sharon. Please read her story below of how God intervened in a life or death situation, and laid His healing hands upon her. Thankyou for sharing this story, Mom. I'm so glad God's plan was to spare your life back then and that your family did not have to suffer such a great loss. I am also so glad to have gotten the chance to meet you, and to have you as a part of MY life. During the summer of 1978, I experienced what I believe was a divine intervention from the Lord. My appendix ruptured and I did not know it at the time. It is hard for some to understand how that could happen without my knowing it. You see, I had other issues that caused severe pain at different times, so that is why I did not recognize what had happened. It was 3 days later when I knew something was "not right" and went to my doctor. I was immediately hospitalized. There, I learned about the divine intervention that had happened. My body miraculously formed a sac that caught all the fluids from the rupture, something very rare that would not normally happen to a person. That sac, I later learned, was almost the size of a football. The surgeon said he could not do surgery because he would break that sac and release all the poison into my body. I would have to be on heavy doses of antibiotics until the sac would shrink and surgery could be safely done. I was sent home. I was to be on complete bed rest, and the only time I could leave the house was to go to the doctor’s office. This was a challenge, as I had 3 young children. The oldest one is now this blog owner’s husband. I felt myself getting weaker, not stronger, each day. One evening, when I could hardly speak, a friend of mine called me and she knew something was wrong. She hung up and immediately called mutual friends of ours, a pastor and his wife. They called me. They knew I was so weak I could barely speak, so they said, “Just listen while we pray.” After praying, they just kept talking to me as I listened. By the time they finished talking to me, I could already feel myself getting stronger. I could sit up and talk. From that time on, I grew stronger and stronger each day. The doctor reports were encouraging, as the sac was shrinking. When the sac had shrunk to about the size of a golf ball, after about 2 months, I had the surgery. If any of you reading this think that, when you take a meal to someone who is ill, you have not done much, let me assure you that you have been a real blessing to that family; and, if you think your prayers are not important, you are mistaken. Thanks for sharing that amazing story. God is so good, and He uses friends and family to step in and help in such times, in His name. Thanks for sharing blessings today. Think could be that more have not shared (commented) is the fact that we do not see this much in the church of Jesus Christ anymore. But, the need is still the same. The blessing was that Jesus was in these ladies to be Jesus to the Stankus family. Thus...how enriched, strengthened and bless they were. "Lord, help ME to be more thoughtful of others and be there for them in their times of need."